Contemporary colors and designs jump off the page with screenprinted Lokta origami paper featuring a galaxy of stars and constellations in metallic gold on a dark, Sapphire Blue paper. Nepalese paper artisans hand-craft Lokta paper out of fibers from the bark of the Lokta bush and then silkscreen eye-catching designs onto the sheet. 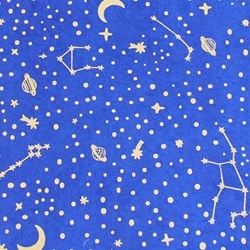 Inspired by the stars, the Constellation design features a universe of stars and constellations representation of a galaxy of stars and constellations in metallic gold on a dark, Sapphire Blue paper.